In his famous book, The Greatest Show on Earth, Richard Dawkins’ presents a Forest of Friendship story, which contains within it a powerful idea that has broad implications for how we develop important social, economic, and political institutions. I want to show how this idea provides clues about how to tackle excessively high home rental prices, and offer some suggestions about how to do just that. Imagine the fate of a hypothetical forest - let's call it the Forest of Friendship - in which, by some mysterious concordat, all the trees have somehow managed to achieve the desirable aim of lowering the entire canopy to 10 feet. The canopy looks just like any other forest canopy except that it is only 10 feet high instead of 100 feet. From the point of view of a planned economy, the Forest of Friendship is more efficient as a forest than the tall forests with which we are familiar, because resources are not put into producing massive trunks that have no purpose apart from competing with other trees. But now, suppose one mutant tree were to spring up in the middle of the Forest of Friendship. This rogue tree grows marginally taller than the 'agreed' norm of 10 feet. Immediately, this mutant secures a competitive advantage. Admittedly, it has to pay the cost of the extra length of trunk. But it is more than compensated, as long as all other trees obey the self-denying ordinance, because the extra photons gathered more than pay the extra cost of lengthening the trunk. Natural selection therefore favours the genetic tendency to break out of the self-denying ordinance and grow a bit taller, say to 11 feet. As the generations go by, more and more trees break the embargo on height. When, finally, all the trees in the forest are 11 feet tall, they are all worse off than they were before: all are paying the cost of growing the extra foot. But they are not getting any extra photons for their trouble. And now natural selection favours any mutant tendency to grow to, say 12 feet. And so the trees go on getting taller and taller. Will this futile climb towards the sun ever come to an end? Why not trees a mile high, why not Jack's beanstalk? The limit is set at the height where the marginal cost of growing another foot outweighs the gain in photons from growing that extra foot. The futile competition Dawkins describes is a natural instinct. Civilised society builds institutions to help avoid the negative consequences of such instincts, with rationing systems that foster genuine large scale cooperation. One particularly important part of the economy where our institutions no longer prevent futile competition is in the housing market. I am not just referring to the house and land asset market, where speculation runs regularly runs rife. Rather than mutant trees, it is speculators who try to bid just a little more for each home, wasting resources by overpaying for land. These always end in spectacular crashes where the greatest fool - the last speculator - makes the greatest loss. But they also bring down the real economy as well! I am talking of something more mundane. The rental market. Here too there is a forest canopy. 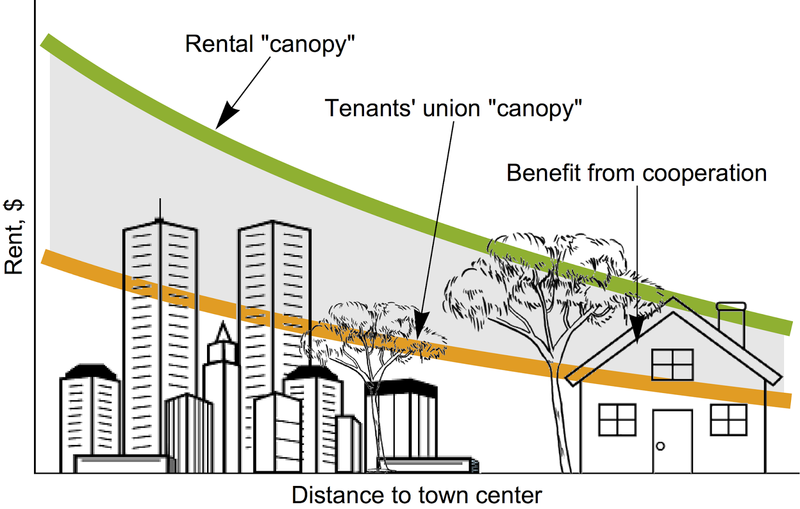 It is an invisible rental price curve, a rental canopy if you will, that expands across the world’s cities, supported not by heavy wooden trunks, but by the wasted resources used by tenants to pay to access the land. While Dawkins’ trees chased a bigger piece of sky, renters chase a better piece of the land. The diagram below shows the basic idea. The green line is the current “rental canopy”, which is higher near city centres, and falls with distance. At half the height is an orange line, which is one possible height of the rental canopy, if a cooperative institution could be developed to stop the futile price competition amongst renters. The grey shading shows the economic gains for renters from an increase in cooperation. So why don’t tenants cooperate like a Friendship Forest? The benefits are clear. In Australia, there are around 2.7 million renting households paying $60 billion per year in rent or $22,000 per household. Halving the rental price saves $30 billion of previously wasted resources by renters, generating massive efficiency gains for them. Large-scale cooperation could happen in practice in the following way. Each renter sends a copy of their lease that shows their current rent to a central organisation. The organisation tells each renter only to pay half the rental amount on the lease to their landlord, and that from now on it will set the rental prices. Because the organisation negotiates on behalf of all tenants, it is a monopoly supplier of tenants to the landlords and can set the rental price. Let us call this organisation a Tenants’ Union. If there are no “mutant”, or “rogue”, renters who opt out of the union and outbid rental prices by negotiating directly with landlords so they access a better home for themselves, the system will work. It is a genuine Friendship Forest. If this cooperative institution could drop the “rental canopy” by half it would save each renting household $11,000 per year. This is great news. It is a perfectly possible and realistic thing that can be done. But there is another side to the Tenants’ Union story. The landlords who own these 2.7 million homes would earn $30 billion less per year. In Dawkins’ story, the landlords are the animals who benefit from inhabiting the trunks, the loggers who cut them for timber, and others in the ecosystem who lose their benefits if not for the resources contributed by the futile competition amongst canopy trees. So that political reality would need to be negotiated. The rest of the story happens within the Tenants’ Union itself. To avoid futile competition, they must enforce a non-price way to ration the better (and worse) homes amongst potential renters. If they can’t do that, they simply shift the futile price-competition from outside the organisation to inside it. I should be clear that any such system would not be perfect either. 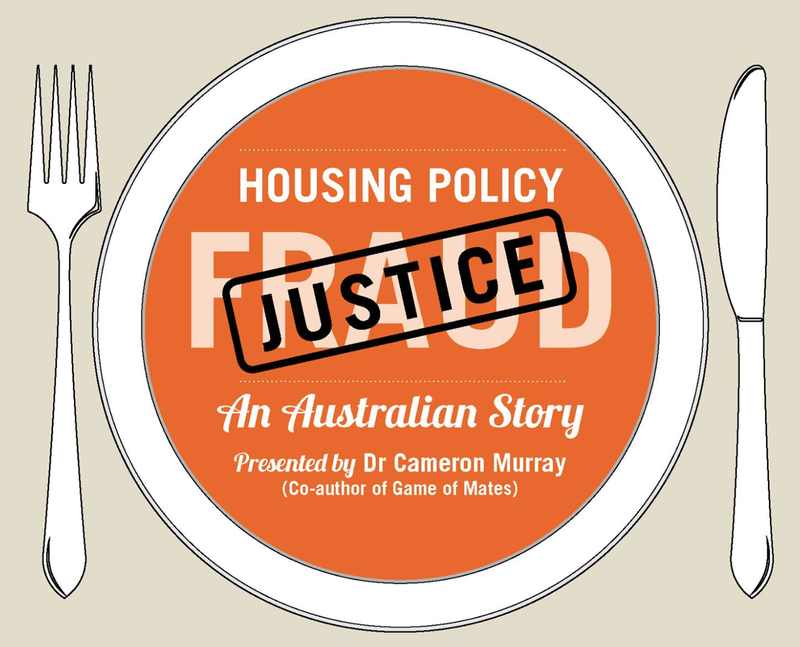 We are therefore comparing an imperfect system of rationing through futile price-competition, costing renters $30 billion, or an imperfect alternative system, that might make the choices of renters more limited, but will benefit tenants $30 billion every year. So what sort of non-price rationing system could our Tenants’ Union employ? I can think of a few. A list is made of people who want to rent a home of a particular type, in a particular location, with new people added at the bottom. Each time a property becomes available, it is offered to the first person on the list. To retain a degree of choice, each person on the list might get 3 veto choices - homes that become available at their turn, but which they could choose not to take, and stay at the top of the queue and wait for the next home. The more effective this system is at reducing prices, the longer the queues. Each time a home becomes available, a lottery is run, with a period of a few weeks in which potential tenants can get a ticket. The winning ticket gets the home. This can be expanded to run in batches at set intervals to overcome problems of having tickets in multiple lotteries at once. 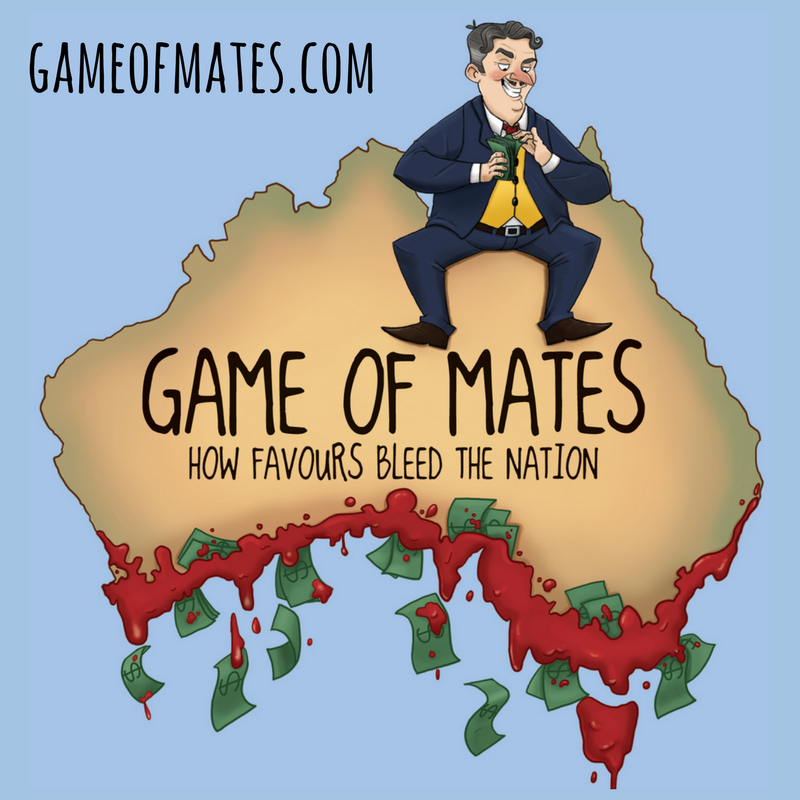 The more effective this system is at reducing prices, the more people contesting each lottery. Homes would go to people based on an assessment of the household's needs. Criteria could include rental history, income, family status, age, other other metric deemed fair and reasonable. Such assessment can be used to determine qualification rules for lottery or queuing systems. Other methods could, of course, be implemented. But to make any of them effective at undermining futile price-competition, secondary markets would need to be outlawed, and this rule rigorously enforced. There are some final points to consider to counteract the likely arguments against this idea, all of which are inherently arguments in favour of futile price competition. First, rationing without prices is itself futile, because "capitalism". Yet in the most important areas of society in all capitalist economies, price competition is strongly avoided. In the courts, we ration by queuing, and ration juries by lottery. In politics, we use elections to ration positions of power. In healthcare, we ration public services based on assessments of need. Spouses are allocated to each other through non-price rationing. Second, non-price systems limit choices for tenants, and that is bad. Yet price-competition also limits choices for tenants. The bottom half of tenants by income already are excluded from choosing the top half of rental homes because of prices. These non-price systems provide much broader choices to the lower income households. Overall, it should be clear that price competition over nature’s scarce resources - be it the sunlight in the forest, or access to the land in the housing market - is usually futile. Human societies overcome this by developing institutions that use non-price ways to ration resources. Taking a stand against price-rationing in the rental housing market by developing institutions like those discussed here could save tenants billions of dollars a year. We should look into it. "The futile competition Dawkins describes is an ingrained animal instinct." An animal instinct in trees? Perhaps the word organic or genetic might be more appropriate here. The difference between a cost (using resources for growing a trunk) and a transfer (paying high price for rent) is that one reduces the total social benefit and one redistributes it. In summary I think this analogy is iffy. At the margin (and here we are probably literally referring to the city's margins) houses are built and sold on virgin land to be rented, if and when the cost of subdividing and laying concrete slabs i higher than the expected rental return. Your hypothetical tenants union would inhibit such a supply reaction. The analogy with the trees fails because sunlight is a fixed resource. The sun only produces so much, so competition is a zero sum game. But with housing we can build more. It's an elastic resource. Price is the signal that tells the market to build more. Removing that incentive guarantees scarcity forever. How can you ask people to wait for years on a waiting list for housing? Where are they going to sleep tonight? Why are people of certain ages or family statuses more deserving of housing than others? The Fair Housing Act makes it illegal to discriminate on most of these basis.